Uncle Bobby must be cleaning out his old photo albums, because he sent us a couple old photos in the mail. 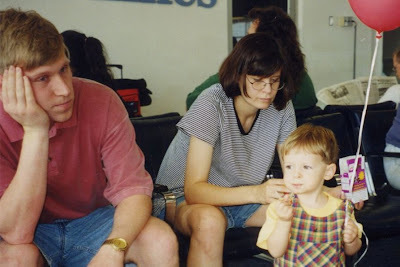 As best as we can figure, these photos must have been taken in the airport somewhere near Tulsa. I believe we were on our way either to or from visiting with Grandpa G. for his eightieth birthday party. Eddie would have been about one year old, and Becky was pre-Lasik. Only Mike looks the same. My fondest memory from this trip was when we took Grandma Harris out to dinner to the restaurant that used to be Furr's out on 14th Street (it was a different "southwestern" restaurant by this time). Grandma was pretty sick and depressed by then. If I remember right, I think she was already diagnosed with lung cancer, and she had been living without Grandpa Harris for over a year. Almost the whole Harris family was at dinner: Aunt Nena, Aunt Pam, Mom, Dad, the whole bunch of us. This dinner would be the last time we saw Grandma Harris, and we kind of knew it at the time. So when it was time for us to leave, I asked Eddie if he'd give Grandma a kiss. I was really worried he wouldn't kiss her, because he was really shy, and he really didn't know her very well. But Eddie did kiss her; he puckered up his sweet little one-year-old pucker, and kissed her right on the lips. It was very nice, and I think Grandma really enjoyed that smooch. Eddie was such a precious baby. 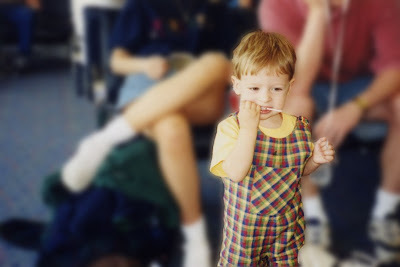 I remember making those shortalls for him.